37 mm diameter, 27 grams, Ag 92.5%, proof quality, flat edge. 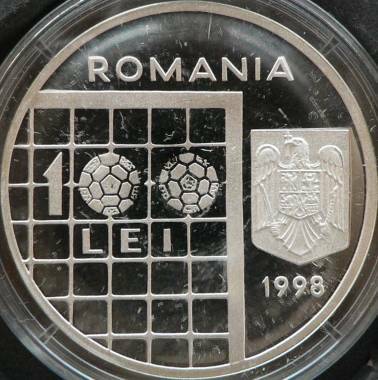 Obverse: inscription "ROMANIA", Romanian coat of arms, year 1998, denomination "100 LEI" inside a football goal. The two zeroes from 100 are footballs. 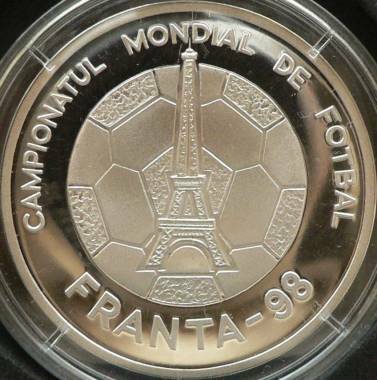 Reverse: Eiffel Tower over a ball and a circular inscription "CAMPIONATUL MONDIAL DE FOTBAL FRANTA - 98" meaning "FOOTBALL WORLD CUP FRANCE"
This is the first Romanian anniversary coin realized at proof quality. It is also the first issued with a presentation pamphlet and with a numbered certificate of authenticity. At the 1998 FIFA World Cup that took place in France our national football team obtained some very good results. In the first game we defeated Columbia, with 1 - 0, in the second game England, with 2 - 1. With an 1 - 1 with Tunisia, Romania won the group (after the spectacular victory with England almost all of the Romanian players dyed their hair blonde, and the coach, Mr. Iordãnescu, shaved his head). Unfortunately, Croatia beat us in the following game with 1 - 0.